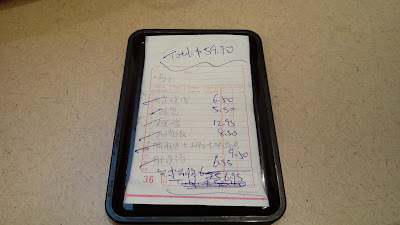 We started off with a three-item plate of Taiwanese Soy Base Boiled 滷味小吃. From a list of ten items, we picked Pork Intestine 大腸, Pork Cheek 豬嘴肉 and Hanging Pork 豬肝連. Topped with Chinese sauerkraut and scallions, this soy-marinated hawker dish was notably appetizing. While it did leaned towards the saltier side, the marinate itself had hints of savory sweetness with adequate seasoning spices that did not overpower one another. 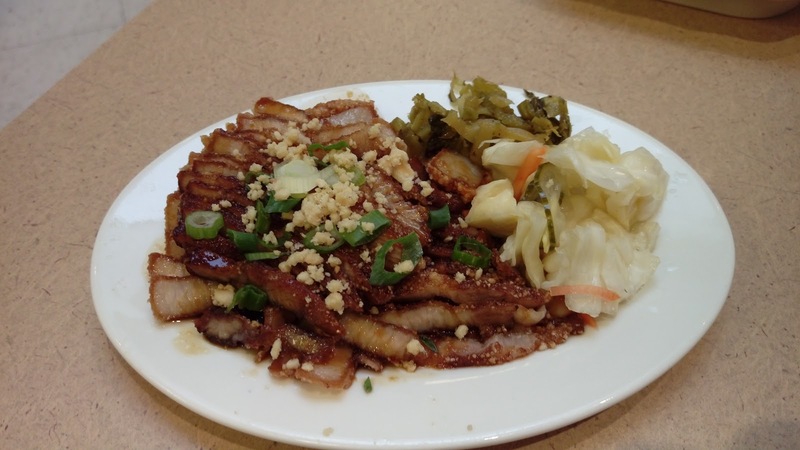 The pork intestine was cleaned very thoroughly with absolutely no disgusting residues or gaminess. The pork cheeks (not to be confused with pork jowl) were delicate and chunky. 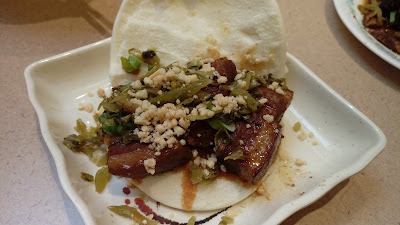 The hanging pork was a bit overcooked so the usual tenderness no longer exists, instead, the texture was quite chewy and firm. 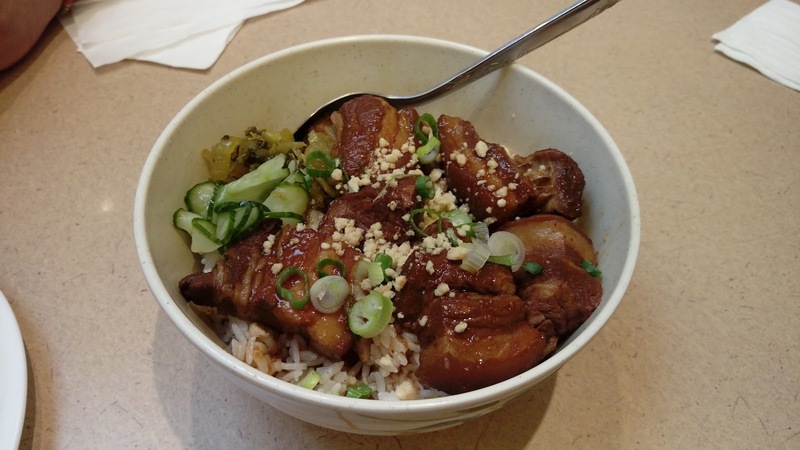 Next came the Braised Pork Belly in Soy Sauce with Rice 香滷扣肉飯. The meaty chunks were overcooked so the textures were chewy and fibrous. Flavor was similar to the previous plate of soy-marinate. Accompanied with cucumber slices, scallions and Chinese sauerkraut, the sauce went charmingly well with rice, which had the firm yet sticky texture of Japanese short grains. 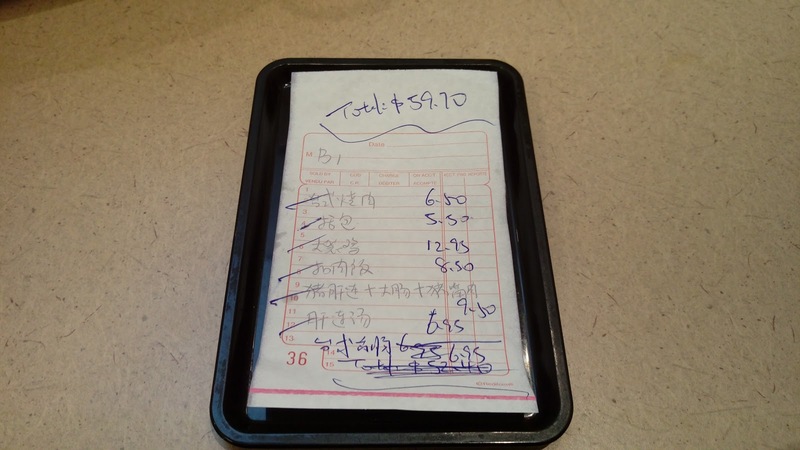 We first read about this restaurant from a Chinese food blog, ambamanchu的網誌. What perked our interest in visiting this little Taiwanese kitchen was for its King Size Bag of Chicken 霸氣大袋雞. According to the menu, the bag contains chicken 雞肉, tofu 豆腐, squid 魷魚, fish cake 甜不辣, fish balls 丸子, pork blood cake 豬血糕, enoki mushrooms 金針菇 and basil 九層塔. There were more misses than hits in this bag. The chicken pieces had this awkward sweetness, kind of like using too much sugar in the marinate. The squid was too tough and chewy to break the bite. The fish cakes slices were horribly soggy and oily. The bag had very limited amount of enoki mushrooms and no basil was detected. The batter was a tad bit thick and the finishing spices was overly salty. The Pork Belly in Steamed Bun with House Sauce, Pickle & Peanuts 臺式括包 was disappointing. As I gently pressed on the bun, it did not bounce nor fluff back to its original state. The bun was a bit dense and lacked that characteristic flour sweetness. The meat was identical in texture as the pork in the rice bowl we ordered. The taste was the same as the cold-marinated protein platter. The Chinese sauerkraut and scallion tried to tone down the heaviness from the pork belly but didn't quite work. The crushed peanuts have lost its nuttiness. 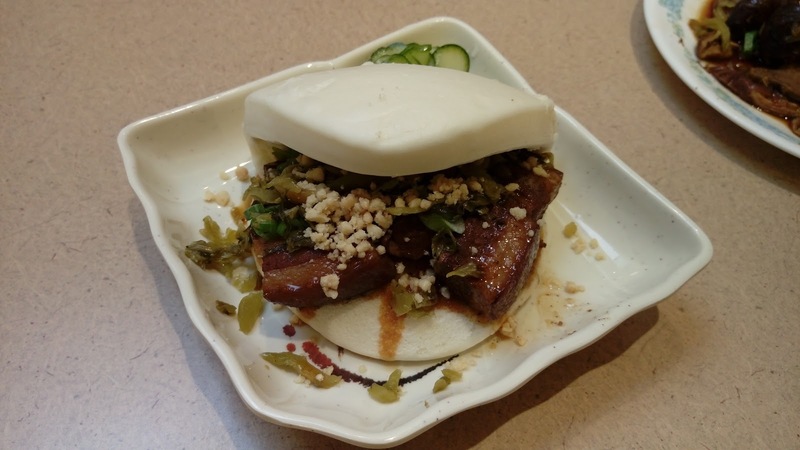 And that distinctive sugariness from candied peanuts commonly found in a classic Taiwanese gua-bao was no where to be found. We're not sure if the Taiwanese Deep Fried BBQ Pork 臺式燒肉 was barbecued at all, but we're certain that the pork was lightly coated then deep-fried. 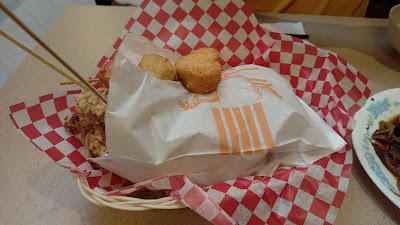 The meat was moist and tender with a crispy outer crust. Based on the grains, the cut of the meat was pork belly, but much of the fat has been removed. The pork was quite flavorful on its own so the finishing touch of soy drizzle was not necessary. The pickled cabbage (Taiwanese-style kimchi) was sweet, crunchy and refreshing. The plate also had Chinese sauerkraut, scallions and crushed peanuts. 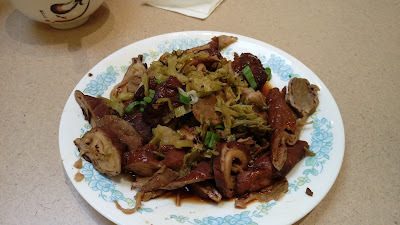 The Hanging Pork with Sour Pickled Vegetable Soup 酸菜肝連湯 was a fail. The soup had a lot of Chinese sauerkraut but it lacked that peculiar pickled fragrance. 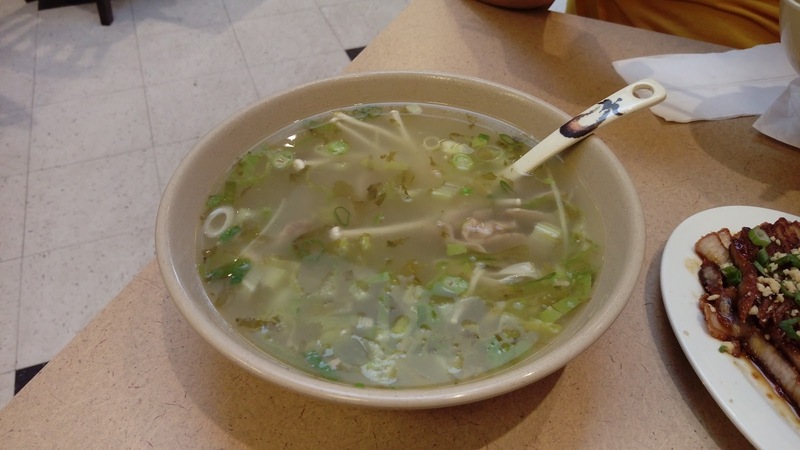 The broth tasted as if there was a downpour of white vinegar. The bowl had a considerable amount of hanging pork with small amount of enoki mushroom...definitely not classic. 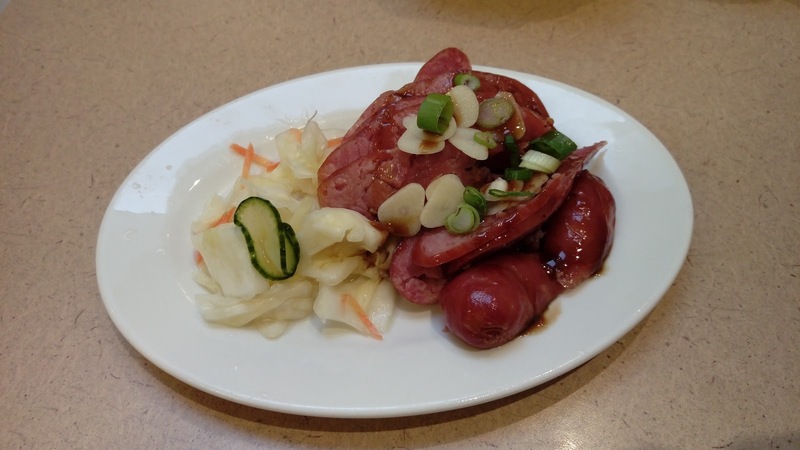 The Taiwanese Sausage 台式香腸 tasted familiar...perhaps from the same supplier as ours? The chunks of fat and meat were visible and the ratio between the two were quite agreeable. The links were plump, succulent and savory without being overly sweet. What ruined the dish was the soy drizzle, which made the sausages overly salty. This small yet roomy restaurant has only seven 4-seater tables and one 5-seater round table. The restaurant was pretty much a full house when we visited and there were only three staff: one cook, one server, one floater (helped between the kitchen and the front). Service was courteous and prompt but food delivery was very slow. While nothing spectacular, this place offers comforting food that can temporarily cure homesickness. That being said, there are other places in 604 that offer similar items with better quality/quantity at similar price points. Most likely not a return for us. I do not agree with you, but of course you can have your own opinion. I don't know if you are authentic Taiwanese, but from my perspective this restaurant has the best Taiwanese food. So far. 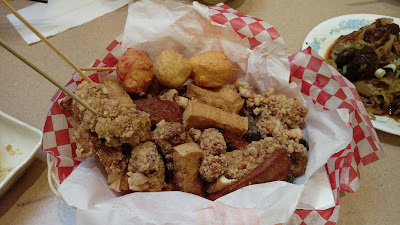 I really want to know which other restaurant, in your opinion, offer better taste of Taiwanese food? Please let me know. Because trust me, I have been trying so many restaurants but none of them can offer me the authentic Taiwanese flavors, even though I'm not a "food blogger" but I know what's the better taste. So, please let me know which restaurant has better taste than this one. You are correct. You do not have to agree with me. And, of course, I can have my own opinions. 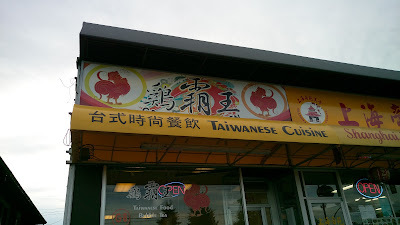 I don't know if I am authentic Taiwanese or not but I do know that I was born in Taiwan, raised in Taiwan/Canada, been visiting Taiwan almost every year since I moved to Canada, and my family/relatives owned restaurants/stalls in different parts of Taiwan. In my opinion, there's no one restaurant that's better than the other in terms of Taiwanese food. It's usually one or two dish(es) from here and there. So if you say that this place offers you the best Taiwanese food, then I'm happy for you, congratulations. So yes...our blog is our opinion.